Rear silencer d / g seat leon ragazzon ii 2.0tfsi en / cupra (147 / 177kw) 09/2005. Stainless steel duplex silencer g / d with 2 round outlets 70 mm offset change the original bumper cut and connection. Inlet internal diameter 65 external diameter tube 60 approved the top line line, entirely in stainless steel, includes a range of rear exhaust pipes with left / right outlets or with central outlet, lines with valves and additional accessories. These products, which can satisfy the most demanding customers, represent a true "highlight" for your car; indeed, they offer an incredible sound, an innovative design and guarantee optimal performance for your car. Available with a variety of 2 or 4-output bits, the top line line highlights the experience and competence of the Ragazzon company, and reflects the attention to detail in the quality of materials, machining and the complete satin finish of the products. The top line range represents a unique line of its kind! On order 7-14 days (except models only on manufacture) - shipping by ragazzon italy - standards fia-csai, cee, tüv. Warning: some rare models may be temporarily out of stock or in production, therefore the deadlines may be exceeded. We invite you to consult us for this type of product. From the registrar office to obtain the cee homologation. These controls provide for different phases, such as longevity of the line, backpressure tests, and phonometric tests on and off. The analysis of the resistance of the materials used to make the muffler. If the exhausts pass the tests, the approved organization issues the. Which certifies the quality of the product, valid in all member states of the European community, recognized in Switzerland and in non-EU countries. The installation of a homologated muffler on a car does not imply any change to the vehicle registration certificate in accordance with Directive 70/157 / EEC and subsequent updates. We have been trading on the internet since 2001. Importer of the brand tyc lighting and mirrors. Importer for France of the brand car sound catalysts replacement. Importer for France brand magnaflow performance lines / stainless steel exhausts. Importer for France of the asso brand racing sports exhausts. Official distributor ragazzon lines sports exhausts and performance. + 38 000 references in tolerie / bodywork for Korean Asian Europeans. To contact the good service. Tel salesperson / advice: gilbert 04 42 49 69 24 06 60 17 33 17 from 14:00 to 17:30. Tele-salesman / advice: solène 04 42 49 69 24 from 14h to 17h. We are closed on Saturdays and Sundays. Single-member company with a capital of 1000 euros r. S aix en provence n °: 535 376 008. The tool for free sale. Put your items on sale quickly and easily, and manage your ads in progress. The item "rear silencer d / g seat leon ragazzon 2.0tfsi en / cupra (147 / 177kw)" is on sale since Tuesday, September 5, 2017. 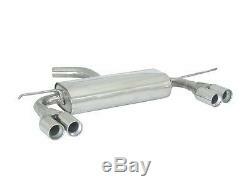 It is in the category "auto, motorcycle parts, accessories \ tuning, styling 'exhausts \ complete exhausts'. The seller is "auto parts-accessories" and is located in priula.